It is known since the seminal study of Laskar (1989) that the inner planetary system is chaotic with respect to its orbits and even escapes are not impossible, although in time scales of billions of years. 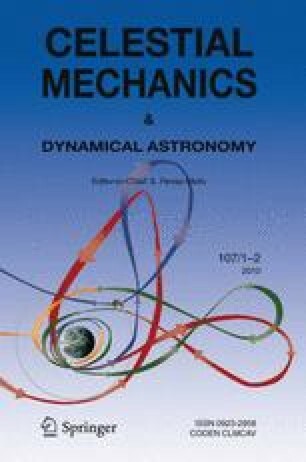 The aim of this investigation is to locate the orbits of Venus and Earth in phase space, respectively, to see how close their orbits are to chaotic motion which would lead to unstable orbits for the inner planets on much shorter time scales. Therefore, we did numerical experiments in different dynamical models with different initial conditions—on one hand the couple Venus–Earth was set close to different mean motion resonances (MMR), and on the other hand Venus’ orbital eccentricity (or inclination) was set to values as large as e = 0.36 (i = 40°). The couple Venus–Earth is almost exactly in the 13:8 mean motion resonance. The stronger acting 8:5 MMR inside, and the 5:3 MMR outside the 13:8 resonance are within a small shift in the Earth’s semimajor axis (only 1.5 percent). Especially Mercury is strongly affected by relatively small changes in initial eccentricity and/or inclination of Venus, and even escapes for the innermost planet are possible which may happen quite rapidly.